FACTS OF INTEREST: Moose live in all the forested areas of Canada, and in Maine and the Northern Rockies. 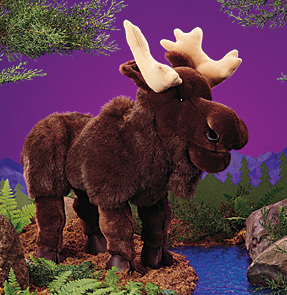 'Moose' means 'twig- eater' in Algonquian. A bull moose can be seven and a half feet tall at the shoulders and weigh 1600 pounds. They have the biggest antlers in the deer family. Moose can walk through deep snow with their long legs. They also dig beds in snow to insulate themselves from extreme cold. Moose like water. They can dive down 20 feet to feed on bottom growth. They also will swim long distances to escape grizzlies.